This recipe is for anyone that doesn’t like spending a lot of time making dinner. It’s for families that enjoy having home cooked meals on a Tuesday just because they can. Or for them peeps that feel better eating a casserole style meal that’s free from grains. Ya… this one is so for you. And the bestest part? This grain-free, simple casserole is packed with seasonal veggies! Roots, beans, you name it. It’s warming, it’s easy, and best of all, it’s delicious. 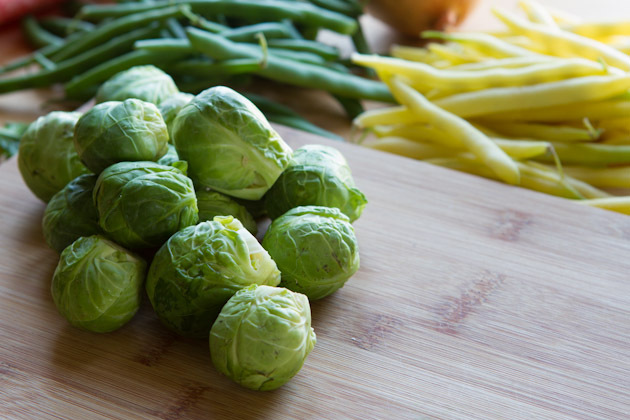 Since posting a roasted garlic Brussels sprout recipe earlier this year I’ve learned that many of you are on team Brussels sprout love, so I added them in this recipe. Feel free to omit if you’re on the opposing team and can’t stand the little gems. 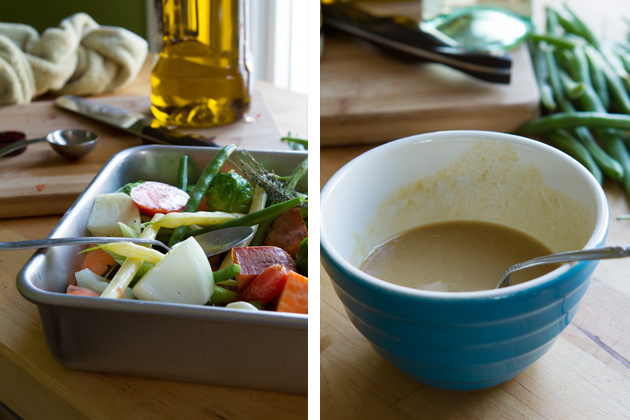 This dinner is high in veg, protein and comes with a delicious maple sauce. I added purple carrots into my vegetable mix which made the sauce come out a bit purple. Beware. 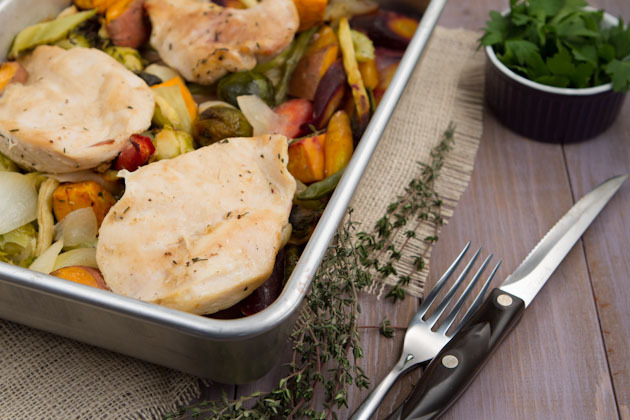 A weeknight meal with roasted Winter veggies and chicken breast in a homemade maple sauce. Simple to prepare and so unbelievably delicious. Place cut up (don't forget to wash!) veggies in a 13x9 baking dish. Coat with olive oil, add sprigs of thyme and stir. Meanwhile, prepare maple sauce: add mustard, maple syrup and vinegar to a bowl. 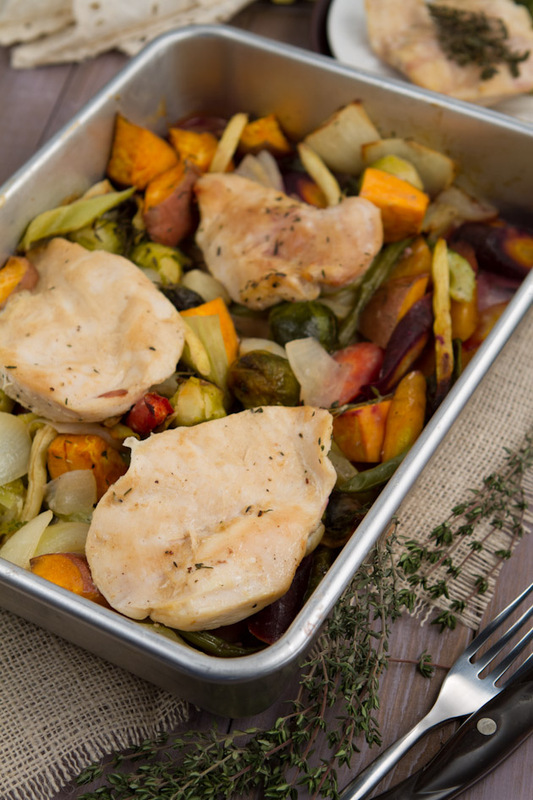 Remove vegetables from the oven, place chicken breasts over top and add in sauce. Stir to coat everything in the sauce and then lay the chicken breasts flat in the pan, covered in veggies. 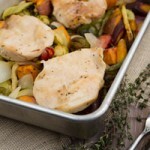 Return to the oven for 30 minutes, or until internal temperature of the chicken is 165F. Remove from the oven and allow to sit for a couple of minutes before serving. Feel free to add whatever vegetables you have on hand. This recipe is very forgiving! 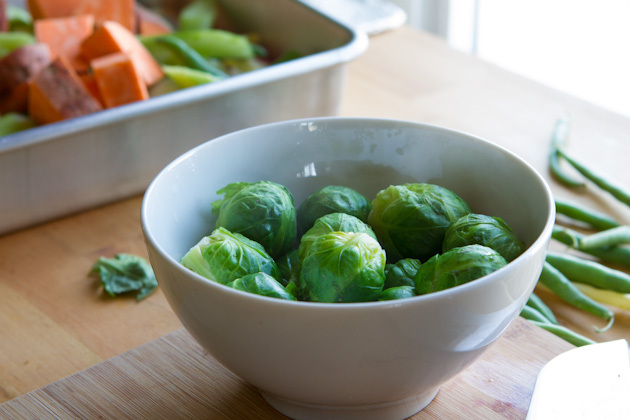 Lightly steam the Brussels, just so that they’re softened and they can soak up all the juices while they’re cooking with the rest of the veggies. 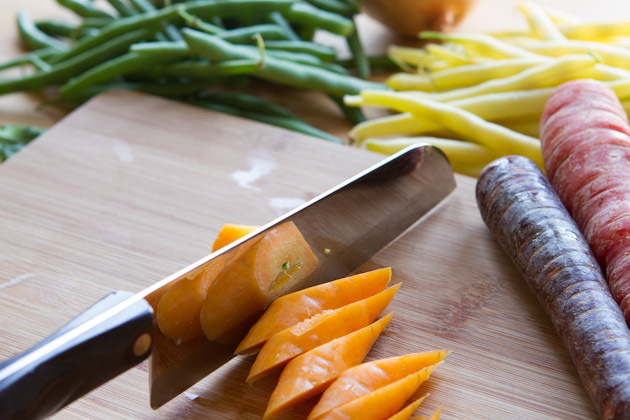 I sliced my carrots on an angle like in the picture above, just to give it a fancy look. 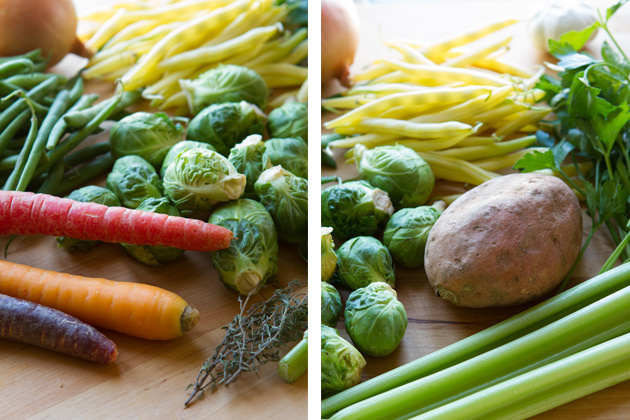 While the veggies are roasting, get your sauce ready! 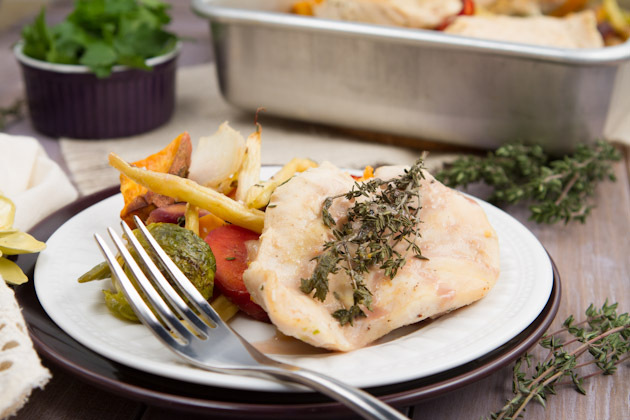 There are many maple Dijon chicken recipes out there, but they all call for SO much sugar! I found the flavor was just as good with half of the maple syrup. 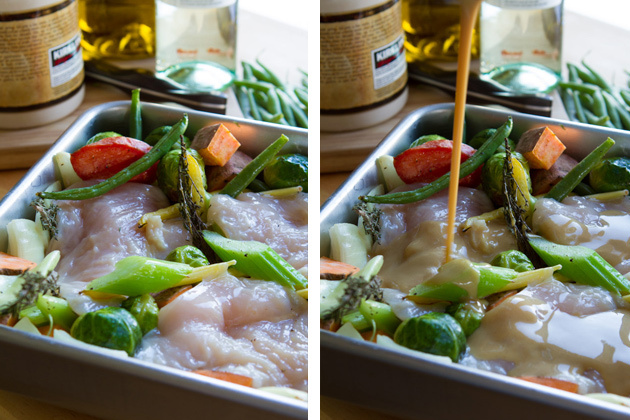 Once the veggies are done pre-roasting, you can add the chicken, add the sauce, mix it up together and roast it! This recipe made four portions, two for Kevin and I while I was still at home, then I took the other two with me on the plane to snack on during my trip to New York. Nothing like a big batch of home cooked food for a day of travel, I tell ya. A little update from The Big Apple: the hostel is fabulous, very clean and really fun! I was able to make myself a super awesome breakfast yesterday and this morning with ingredients I bought from Trader Joe’s (what a magical place). And; despite my intense anxiety about it, the subway is relatively easy to use… granted you know where you’re going. Thank goodness for Google Maps. I’ll have loads more to share with you in the coming days – great restaurants, cool spots, and course updates, but for now I have to get ready for class! Do you bring pre-made food with you on flights? What are your favorite things to bring?